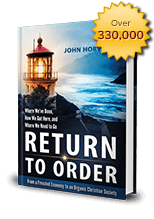 The Terry Lowry interview of John Horvat on Houston’s KKHT 100.7FM aired on December 9, 2013 about his book Return to Order and how it relates to the practice of medicine. If we had problems in the delivery of healthcare before, the current standardization under “Obamacare” further mechanizes medicine. What are the human institutions that should be involved in healthcare? Why are these institutions fundamental to good health and healthcare? Who really is the primary caregiver in a free Christian society? The interview is divided into three parts. Please Click the Links below for each segment. The audio file will open on your computer. This entry was posted in Featured and tagged America, Christian civilization, Christian principles, Family, honor, Institutions, interview, leadership, moral values, Natural Law, Order, organic Christian society, Return to Order by RTO.org. Bookmark the permalink.